My massage sessions usually last about 1 hr, I will do an initial evaluation of the horse and give you my assessment of him/her and what possibly caused the problem and how we will go about to fix it. I use Massage and Trigger Point release together to get the best results for your horse, in the shortest amount of time. I can usually get results in about 7-10 days depending on what is wrong. Scheduling fee $25 -will be part of the price of the Massage Session-24hr Cancellation Notice Required or Fee is Not Refunded-payable thru Paypal only. Evaluation is free with a massage, if no massage is required, $10 for evaluation plus mileage. I will do a FREE Saddle Placement/Fit if I feel the saddle is the problem. 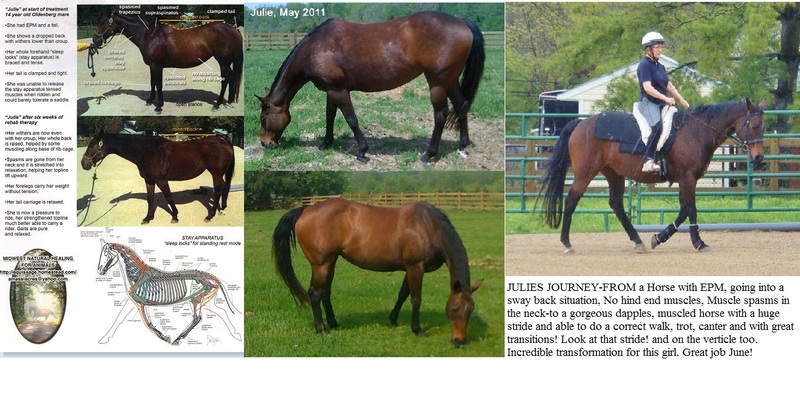 Learn how to find pain and soreness in your horse, thru sight and feel! Great skill for those looking for horses and trainers!